Shedding a bright light on culture. The older I get the more careful I must become with references to older TV shows. Several times in this past year an employee at one of my training meetings has shared a story or asked a question that’s triggered a thought. I’ll reference an old favorite TV show when making a point or attempting a humorous anecdote, only to be stared at like a caveman at an astronaut convention. Well, here I go again. What a quick learner, huh? Patrick Lencioni, in his book, The Advantage, discusses smart organizations vs. healthy organizations. Smart companies are good at the fundamentals of business ­- strategy, marketing, finances and technology. These are critical pursuits of any successful business, yet represent only half the equation. Healthy companies are measured by minimal politics, open communication, quick decision-making, high levels of morale and productivity and very low turnover among employees and clients. Lencioni’s point is that you need to be both and that too many leaders focus almost all their time, energy, and attention on just the smart side of the equation. He references an old “I Love Lucy” episode to highlight the common mistake too many leaders make in this lopsided focus. Most of us tend to look for answers where the light is better. Where Gantt charts, excel spreadsheets, financial reports, call logs, etc., are the “go-to” and comfortable, smart resources. Yet our greatest opportunity for a sustainable market differentiation and competitive advantage lies in our pursuit of a healthier organization or what we call a High Performing Culture. I had the pleasure of speaking this past week at a private equity firm’s CEO Roundtable. 15 experienced, bright, innovative, driven, and very successful leaders spent the afternoon discussing industry trends, opportunities and threats, as well as sharing their own organizations’ two greatest challenges. Amongst the “repeat offenders” (challenges) of many CEOs, was culture. They shared the same pains. Lack of market differentiation, eroding market share, employee “churn”, client retention, poor communication, and the challenges of hiring great talent in a very tight labor pool. The topic of culture was referenced by many of the leaders and yet few were dealing directly with or knew how to tackle this critical issue. There was universal agreement that improving their culture was critical to their bottom line and sustained success, but they lacked clarity around a simple and effective solution. At High Performing Culture, we’ve shone a bright spotlight on the process for companies to be more intentional and systematic about creating and institutionalizing the culture they want to drive their success. 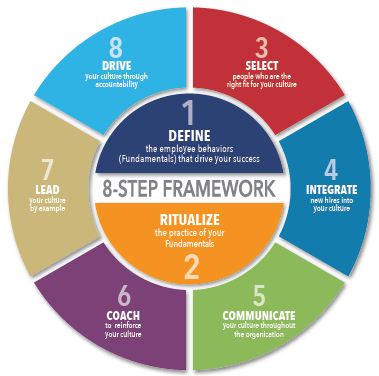 The 8-Step framework of our Fundamentals System™ provides the foundation for the design, implementation and continued practice of a higher performing culture. It organizes the steps into a simple roadmap you can follow on your way to becoming a healthy organization. In previous posts we’ve talked about some of the individual elements in the roadmap, and while each is independently valuable, it’s the integration of all the pieces that makes the approach so successful. If you’d like to learn more about how you can apply the 8-step framework to improve your company’s health, give us a call, shoot us an email, or join us at Culture Summit 2017. We’ll leave the light on for you!